"I know what women want. They want to be beautiful." Master couturier and Italian designer Valentino Garavani will be honored at an exhibition opening this November at Somerset House in London. The display will feature over 130 of Valentino's most exquisite creations including designs worn by fashion icons such as Jacqueline Kennedy Onassis, Grace Kelly, and Julia Roberts. The exhibit will celebrate 50 monumental years of Valentino's design career that began in the late 1950s, and give visitors a glimpse into Valentino's life. "Each of these designs has a beautiful story," Valentino said of the dresses to be displayed. "The atelier crafted each so diligently by hand, taking hours, sometimes days to complete. The details are incredibly intricate. Though outside the runway shows and events, the dresses have rarely been seen. To be able to showcase these designs at Somerset House, where they can be seen in great detail by the public, is very unique." Valentino is best known for using his signature color red, but that was not always so. In 1968, he debuted one his most memorable collections - the "White Collection." According to the Milwaukee Journal on January 15, 1968, "Jacqueline Kennedy's favorite Roman designer concentrated on white in the preview of his collection for international store buyers and press. What was not white could be beige, black or navy -- adding up to the dictum 'no color.'" 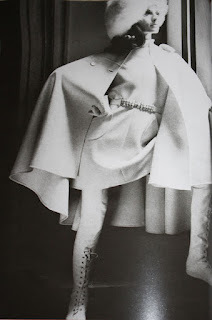 The much-talked-about "White Collection" was also the beginning of Valentino's trademark "V" that he began strategically incorporating into his garments. Accompanying white shoes and stockings, the Milwaukee Journal also reported that the show began with a "series of short white coats worn with matching hats shaped like inflated berets." 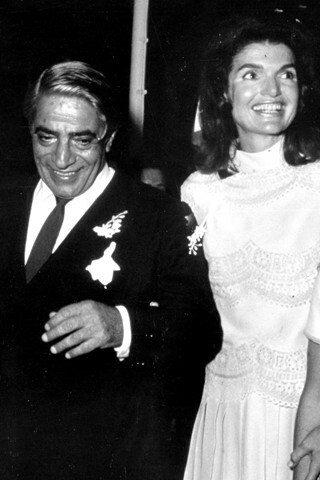 It was this very collection that included the dress Jacqueline chose to wear for her wedding to Aristotle Onassis, which will be on display at Somerset House in a few months. I purchased a canvas-like, printed Valentino fabric with a slight stretch from Mood this summer. I transformed it into a pair of shorts and sewed in belt loops. If you squint, you might be able to see "Valentino Jeans" written within the print. Valentino may have passed the torch of his fashion empire onto someone else, but his majestic designs will not be forgotten.